One of Ireland’s most tragic daughters, Grace Evelyn Gifford, was born on March 4, 1888, the second youngest of 12 children of a Catholic father and a Protestant mother in Rathmines, Dublin. As was then the practice, the boys were brought up Catholic and the girls as Protestants. Grace went to school in Dublin and later studied under Irish artist William Orpen who regarded her as most gifted. In 1907 she attended a Fine Art School in London and returned to Dublin in 1908 to work as a caricaturist, publishing cartoons in several magazines. She earned little money, but enjoyed a lively social life. A lady journalist friend brought her to the opening of the new bilingual St. Enda’s School where she met Joseph Mary Plunkett for the first time. She also met the future leaders of the 1916 Easter Rising, including Tomás MacDonagh, whom she introduced to her sister Muriel. They married in 1912 and Muriel became a Catholic. Grace’s also showed interest in the Catholic religion leading to a closer acquaintance with Joseph Plunkett. She could not have found a better teacher since St. Oliver Plunkett had been an ancestor and Joseph’s father was a Papal Count. Joseph proposed to Grace in 1915 and she was formally received into the Catholic Church in April, 1916. Not knowing the date that would be set for the Easter Rising, they planned to marry on Easter Sunday of that year. Joseph hadn’t told Grace of the impending insurrection on which he had been working. Neither did he expect it to be scheduled for Easter Sunday, nor that he would require emergency surgery the week before for his chronic TB. As it turned out, the surgery forced postponement of the wedding, and other circumstances forced the postponement of the rising to Easter Monday. The first indication to Grace that something was going on came on the evening of Holy Saturday when Plunkett’s young aide, Michael Collins, dropped by to deliver her a sum of money and a small gun for her protection. Grace was horrified at the sight of the gun, but Collins left without offering the confused Grace Gifford any further explanation. Joseph left hospital to join his comrades and one can only imagine the anxiety and distress experienced by Grace as the events of Easter week unfolded with her beloved in the center of the fighting. After the Rising failed, Joseph and the other leaders were swiftly court-martialed and sentenced to death. When Grace learned that Joseph was due to be shot on 4 May; she hurriedly visited a Dublin jeweler and bought two wedding rings. On the night of 3 May she was given permission to visit Joseph. By arrangement, they met in the prison chapel where the prison chaplain married them with two prison guards as witnesses. Accompanied by fifteen soldiers they crammed into Joseph’s tiny cell, on the wall of which he had scratched his memorable poem I See His Blood Upon the Rose. After only a ten-minute visit, Grace was ushered out. A few short hours later, Joseph was executed in the stonebreakers yard at Kilmainham Jail. Grace endured several almost unimaginable losses within the time span of just over a year. Aside from the loss of Joe and Thomas MacDonagh, her brother-in-law, many of her friends were also executed for their roles in the Rising. 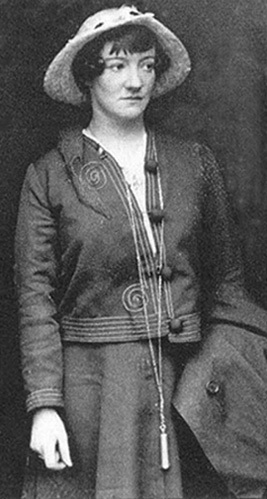 In August 1917, her sister, Muriel, (MacDonagh’s widow) drowned, leaving two small children. One month later, Grace’s father died. On top of all that, Joseph’s parents refused to honor Joe’s will in which he left everything to Grace and she had to take them to court. Seven years of legal wrangling ensued before she was awarded just £700. She didn’t even have her own family to lean on as her mother had disowned and cut her off for converting to Catholicism in order to marry Joseph. She devoted her art to the promotion of the Sinn Féin policies for which Joseph had given his life. Throughout her long widowhood she became a staunch Irish Republican and was even elected to the reorganized Sinn Fein executive in 1917 where she served alongside Kathleen Clarke and Constance Markievicz and opposed the Anglo-Irish treaty of 1921 which led to the Irish Civil War. Throughout the Civil War, many republicans were arrested and incarcerated without trial. Grace herself was one. Arrested in February 1923, she was held in the same Kilmainham Jail where her Joseph had been executed. In what had to be an extremely emotional incarceration, she was moved to paint a beautiful picture on her cell wall of the Madonna and Child, perhaps in honor of Joseph’s middle name. She was released in May, 1923.